Congratulations to Dr. Ilke Arslan, Pacific Northwest National Laboratory, on being chosen as a 2016 MRS Bulletin volume organizer. She joins an international team creating 12 themes that cover state-of-the-art materials research. Each theme leads to an issue with a collection of articles, written by experts. The publication reaches more than 16,000 people. A physicist by training, Arslan's discoveries revolve around structure-property relationships in catalysts and other nanomaterials. 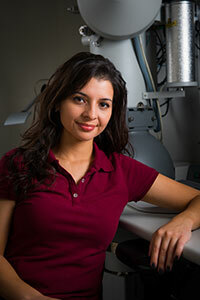 She also develops chemical imaging techniques for electron and atom probe tomography. Her work has earned her research fellowships from the Royal Society USA and the National Science Foundation. Recent recognition includes the Presidential Early Career Award for Scientists and Engineers and honors from the Kavli Frontiers of Science Program at the National Academy of Sciences. She is a member of PNNL's Institute for Integrated Catalysis. The other volume organizers are Richard R. Barto Jr. from Lockheed Martin Advanced Technology Laboratories, USA; Boaz Pokroy from the Technion-Israel Institute of Technology, Israel; and Zhiwei Shan from Xi'an Jiaotong University, China.